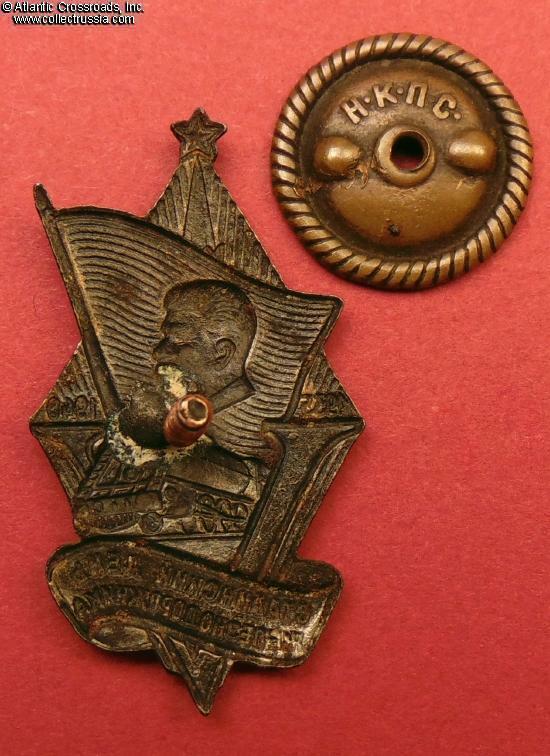 Badge in Commemoration of the 5th Anniversary of the Stalin Railway Worker's Day, 1940 issue. 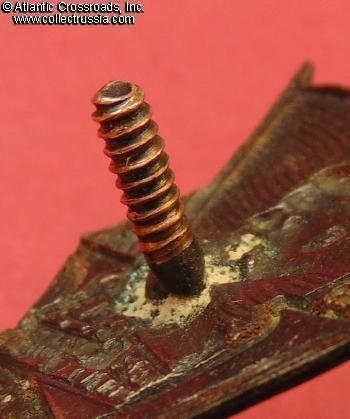 In bronze-plated steel and enamels, measures 44.1 mm in height, 44.3 mm in width; weighs 5.3 g not including the screw plate. 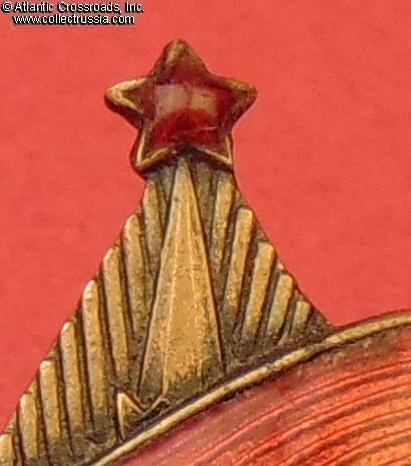 Features Stalin's profile on a red flag, steam engine locomotive, spire of the Kremlin tower with a star, Roman numeral "V," and the dates 1935 / 1940 on the left and right sides of the badge. 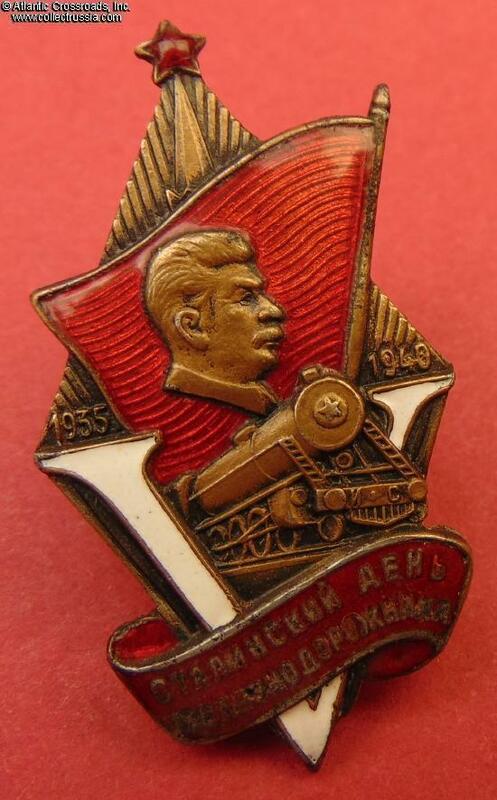 Note the letters ИС ("IS") on the coupler: they stand for the Iosif Stalin, a top-of-the-line series of Soviet passenger steam locomotives built during the 30s. 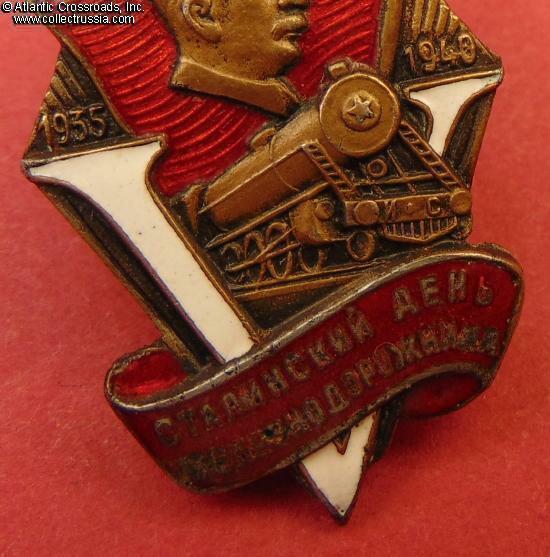 The badge is of interesting design which retains some of the residual Constructivist flair from the 20s while otherwise being in line with the new Soviet "Imperial" style. Condition is excellent, absolutely outstanding for this badge. The enamel retains magnificent luster and is essentially flawless having only a few microscopic contact marks invisible to the naked eye - completely free of the usual scratches, flakes or chips. 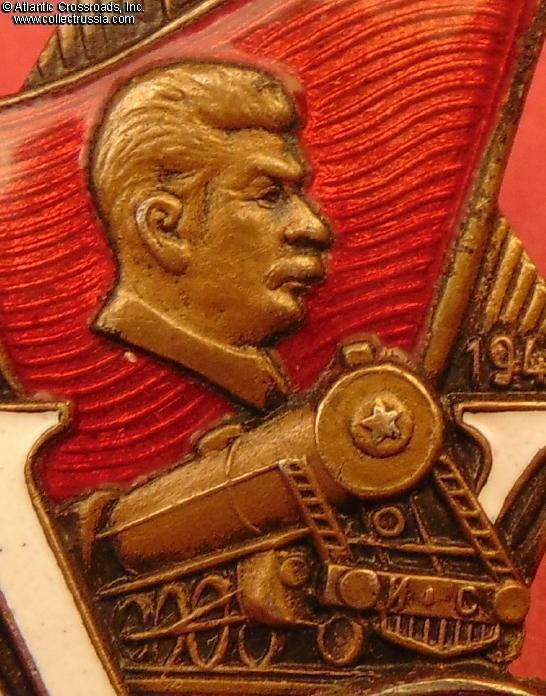 The raised details of the Stalin's portrait and locomotive are extremely well- preserved and crisp, and the bronze finish is almost pristine showing only a tiny bit of wear to the locomotive's star. The screw post is full length, approx. 10 mm. 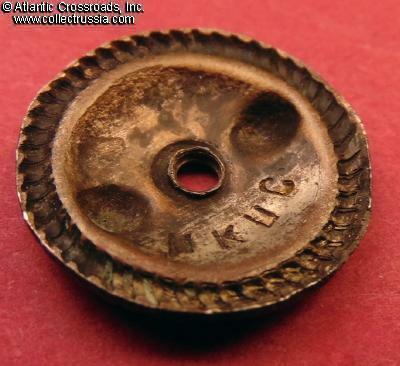 Comes with a very scarce original screw plate maker marked "NKPS". 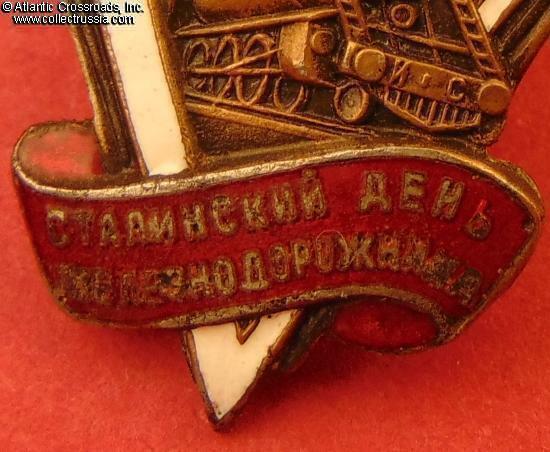 The badge was bestowed only once in 1940 upon a relatively small number of best railroad workers to celebrate the anniversary of the Stalin Railway Worker's Day, which had been celebrated in July of each year starting from 1935. The timing of the award coincided with the early part of WW2, just before the Soviet invasion of Finland and a year before the German invasion of the Soviet Union. 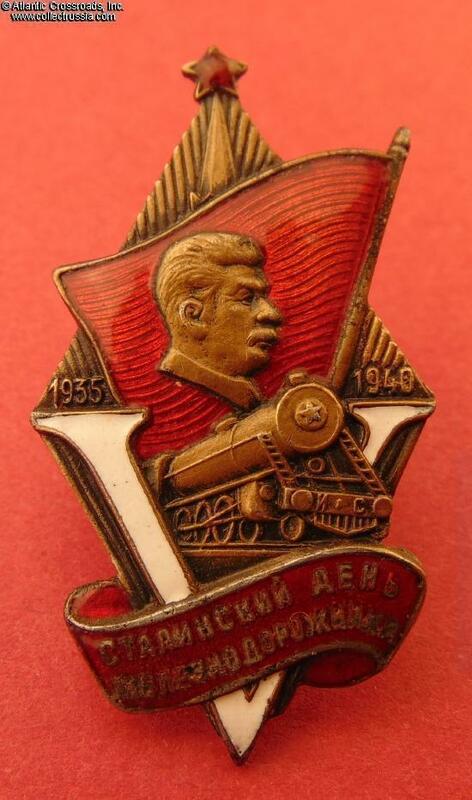 Soviet railroads would soon play a decisive role in the Patriotic War by allowing to evacuate vital industries to the Soviet interior and providing steady flow of supplies to the fronts in the absence of reliable automobile roads. 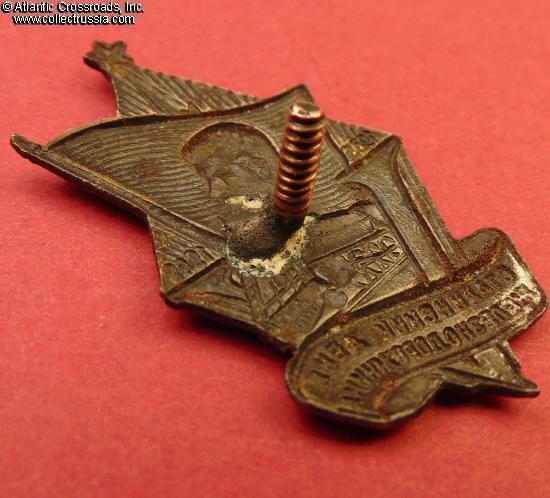 This badge is a very uncommon and interesting piece, both in terms of its design and history.